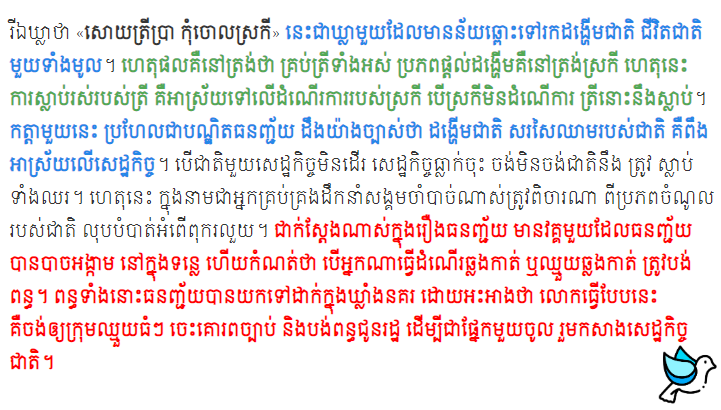 For this round, I have learned about the history of language, Khmer scholar people and last word of Master Tunchey. 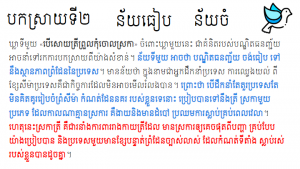 In the history of language research we need to research on where is Khmer language come from, ancient Khmer alphabet and who made khmer alphabet. 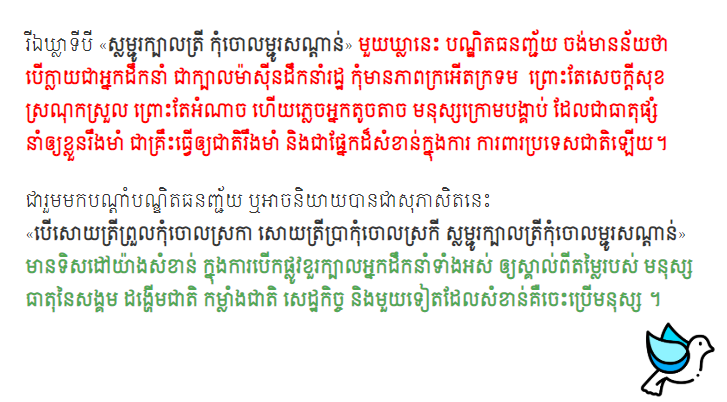 Our teacher have divide us into difference team and do research on those topic. 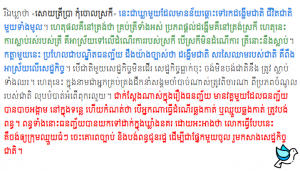 Me and my team do research on Last word of Master Tunchey and Khmer scholar people. The last word of Master Tunchey is “ If you eat proul fish, don’t throw​ the scales and if you eat pra fish don’t throw the gills and if you make fish head soup, don’t forget to put Mju sondan”. 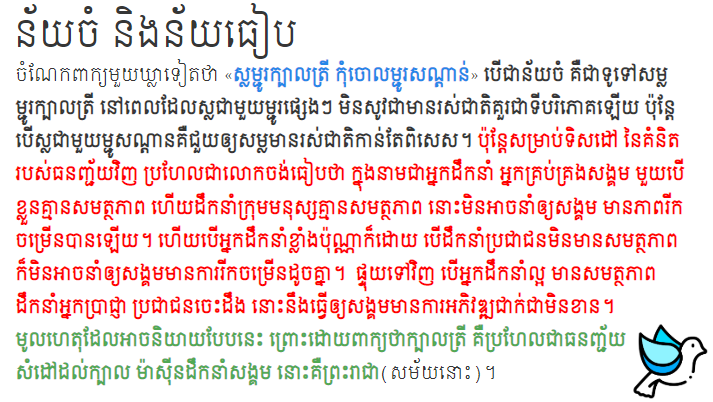 You can click on the link of some words if you don’t understand because these all Khmer words. 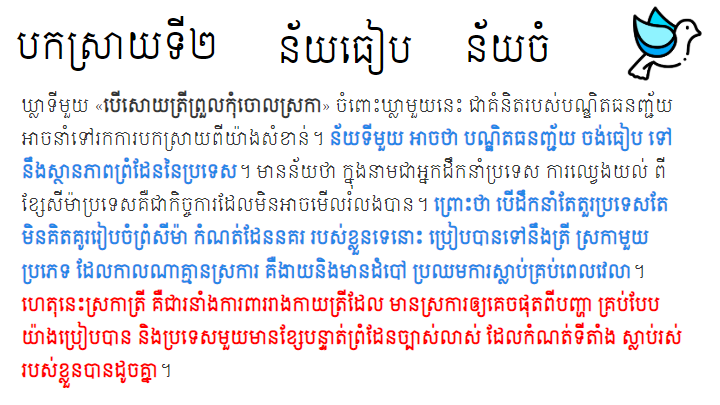 This round we have been learned about Khmer grammar. 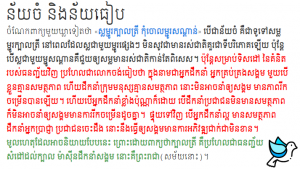 Khmer grammar is almost the same as English grammar. 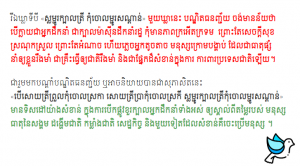 We have pronoun, noun, adjective, verb and more just like English grammar. 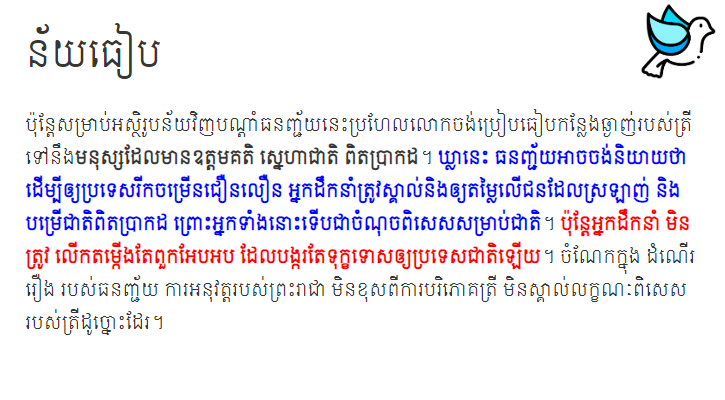 Here is the link to access my Khmer grammar. Khmer literature is one of the most important subject for every Khmer children to learn and get more ideas about what is Khmer Literature. 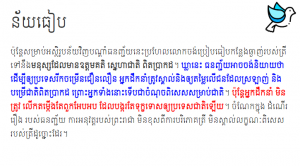 If you are Cambodian, doesn’t mean you are good enough or know enough about Khmer literature. 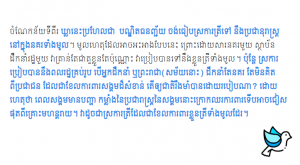 A lot of old Khmer Authors are trying to write some books to get Khmer children to understand more about Khmer literature. 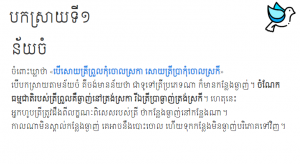 There is an author name Nhuk Time who was born in Svay Pour commune, Sonkea district, Battambang province, write a story book called Kolab Pailin, meaning in A Rose from Pailin province in english. This story is talking about a woman and a man fall in love with each other without knowing the reason. 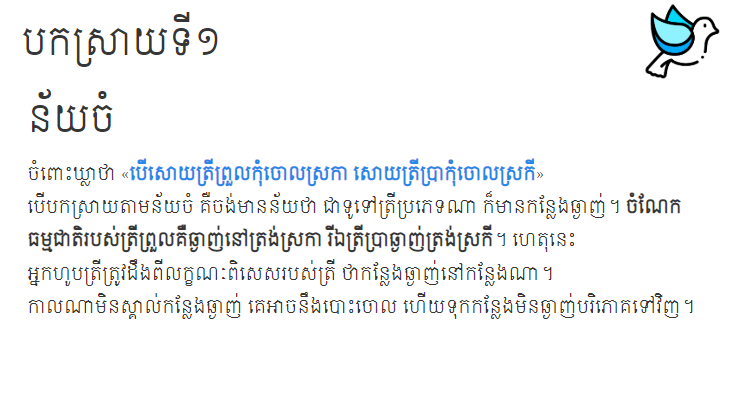 But because her father has a work partnership with a kind of rich boy, in khmer we call Balat. That’s the hardest thing for the women to decide on her lover. Kun Neary is the girl main character in this story. She is a good daughter who always listen to her parents, but she have one bad habit that she always judge people by their appearance without knowing who. For boy main character, his name is ChavChet. He is a good son who always know and love their parents. He also an integrity and brave people. Balat is a man that like to show off to people how rich he is and he does not respect other people especially women. 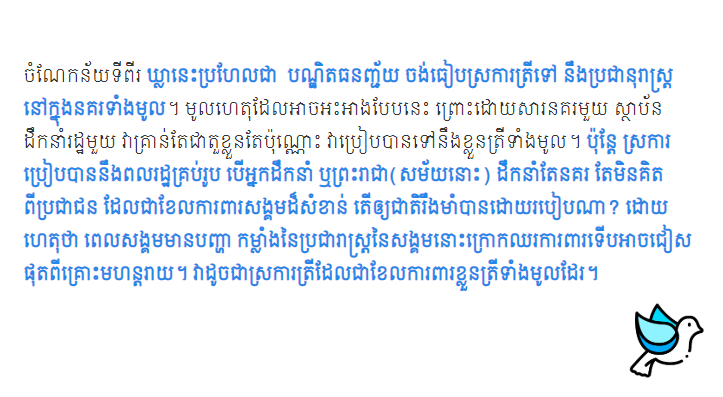 The last character ( he one of the main character ) is call Loung Ratanaksombat. He is Kun Neary farther. He is the kindest person in his village. Everyone love him because he is really nice. In Khmer class our teacher let us making Khmer poem in different types of poem. I choose four words poem which have four sentences per part and four words per sentence. It’s not really hard, but I just need to arrange the part that I made. 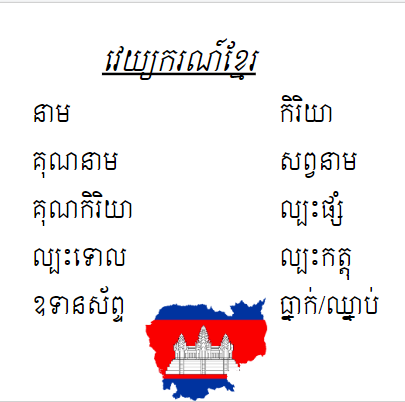 We have three weeks in total to create our poem and arrange it to make it perfect. My Poem is basically about a girl that never listen to her mother. She rude to her mother and discriminate her mother even though her mother loves her with all her heart and always give something that she needs. Her mother is really old, but she trying to find money for her children to have a good future. Finally, her mother died because her daughter hurt her. 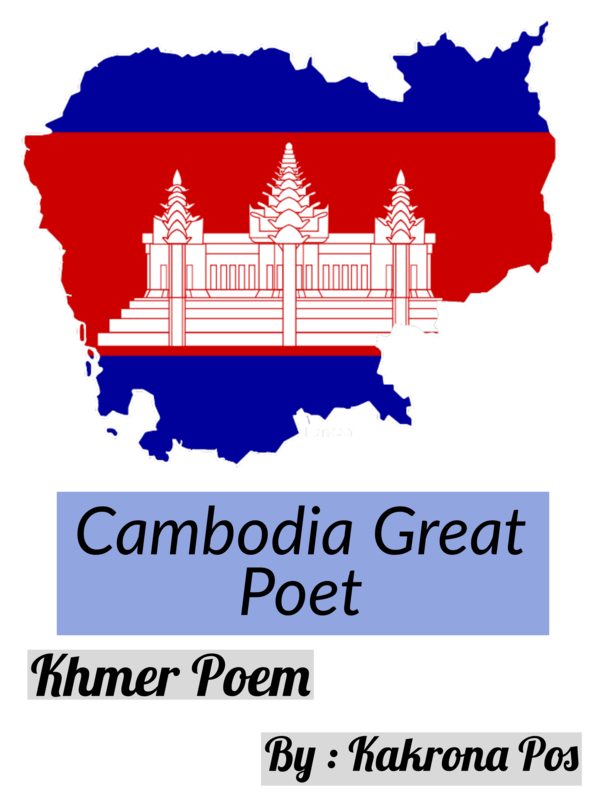 If you want to know more please read my poem.